Stateless persons are not recognized as citizens by any country, and as such, their enjoyment of fundamental human rights depends on the good faith of host countries, and their basic human security and dignity are often subject to the whims of immigration authorities. Despite this intense level of vulnerability, U.S. immigration law does not explicitly recognize statelessness, nor does it provide for humanitarian protection to relieve stateless persons of their suffering. Rather, stateless persons are treated like any other unauthorized migrants in the United States; when they are ordered removed, they are mandatorily detained while immigration officials undertake efforts to execute those orders. Such removal efforts are futile in the case of stateless persons, and when they are ultimately released from detention, they are cast into a legal limbo in which they spend the rest of their lives on immigration parole, uncertain as to what their future may hold. This article argues that it is imperative to establish a protection mechanism for stateless persons in the United States, and critically analyzes a proposal by the U.S. Senate to establish a mechanism for the protection of stateless persons under the Immigration and Nationality Act (INA) as part of its 2013 comprehensive immigration reform bill, the Border Security, Economic Opportunity, and Immigration Modernization Act (SB 744). This article relies on the international law of statelessness as a benchmark for this critique, and argues that that the proposed mechanism may fail to meaningfully address the statelessness problem in the United States if it is not tethered to the international protection framework. 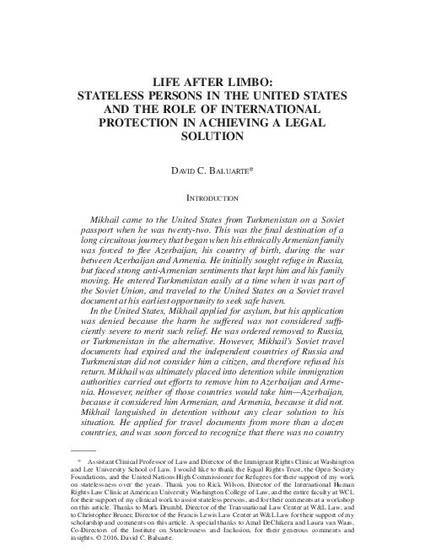 David C. Baluarte, Life after Limbo: Stateless Persons in the United States and the Role of International Protection in Achieving a Legal Solution 29 Geo. Immigr. L.J. 351 (2015).